After a perilous journey through hostile Germany and then Sweden, Bolshevik leader Vladimir Lenin finally returns to Russia from exile to give the Revolution new momentum. RT’s #1917LIVE brings you the latest from 100 years ago. Thousands of workers and soldiers gather at the Finland Station in the capital St. Petersburg (then called Petrograd) late on April 16, 1917, to greet the firebrand revolutionary, who had just returned from more than a decade-long exile in Switzerland. Having struck a deal with the Germans – Russia’s enemy in the ongoing WWI – Lenin and 31 other fellow Bolsheviks were allowed passage through Germany. This could have easily led to them being arrested by the Provisional Government on suspicion of treason. 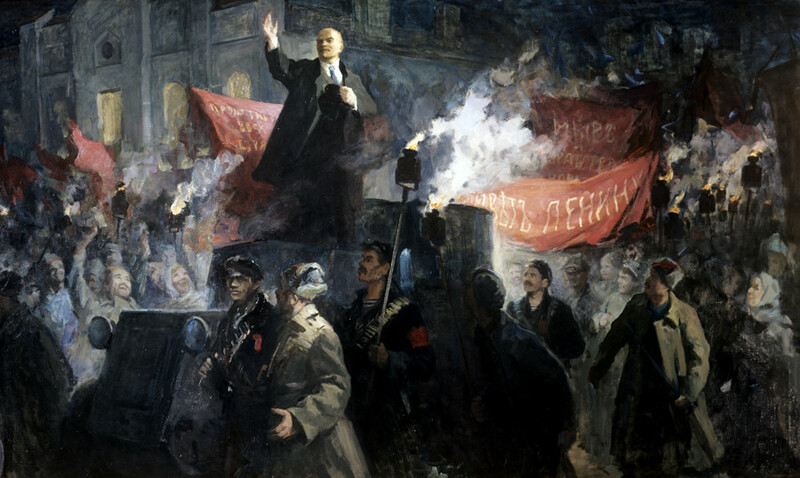 But the reception upon their arrival is beyond anything Lenin could have expected – cheering crowds, accompanied by an orchestra playing the revolutionary La Marseillaise, as well as various types of troops standing in line to greet Lenin. The space in front of the Finland Station is lit with searchlights. As he leaves the station, he boards an armored vehicle and addresses the crowd with a famous speech in which he says the revolutionary Russian proletariat and army kicked off a global socialist revolution – and the whole world is watching. Lenin missed the start of the 1917 Revolution – the Tsar was already ousted a month earlier. In 1905, he also missed the start of the First Russian Revolution. So it was now or never – he was desperate to return to Russia to join the revolution. 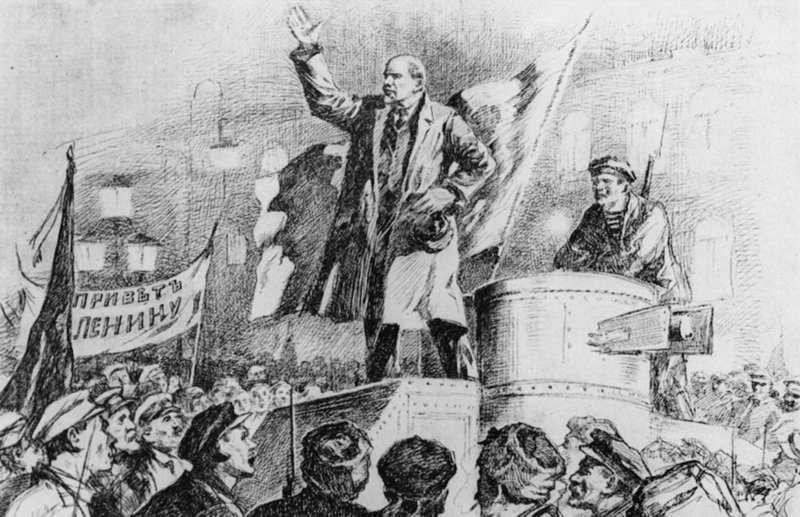 From his long exile in Europe, Lenin brings radical ideas. He is vehemently anti-war, stating, that Russia should withdraw from WWI and turn this “imperialist” war into a civil war against the exploiter classes. Right after the group of political emigres crossed the border between Sweden and the Russian Empire, they started talking to the soldiers, spreading their anti-war message. The Bolsheviks departed from Zurich on April 9 and traveled through belligerent Germany in a “sealed” train car – it was designated an extraterritorial entity and no documents were checked. They then crossed the Baltic Sea and arrived in neutral Sweden, where they met with local Socialists and other Russian political emigres. In Stockholm, the only known picture of the group was taken. Here Lenin (with an umbrella) and his fellow Bolsheviks walk through the city accompanied by Swedish Socialists Ture Nerman and Carl Lindhagen. The risk of being arrested is alarmingly high at the Swedish-Russian border, which back then was in Finland. Allied British officers thoroughly search them at the border, but unable to find anything suspicious, they let them go. So off they go, and Lenin makes it to revolutionary Petrograd. Months of political struggle are ahead of him, but the idea of turning a bourgeois revolution into a socialist one is to gain massive support and the dictatorship of the proletariat is looming. RT’s interactive #1917LIVE Twitter project allows you to follow the latest news from revolutionary Russia as they unfold in real time, 100 years ago.